Share market HIGHLIGHTS: Bloodbath in the domestic equity markets continued for the second consecutive session on Thursday, with the BSE Sensex slumping 953 points to an intra-day low of 35,022.12 points and the Nifty slipping below the 10,600-level. 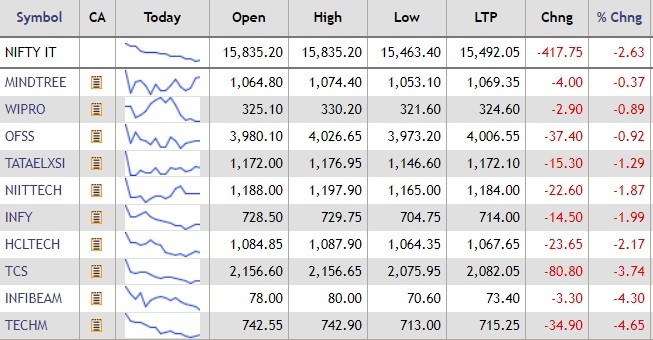 Share market LIVE: All the sectoral indices on the NSE slipped into the negative territory. Share market HIGHLIGHTS: Bloodbath in the domestic equity markets continued for the second consecutive session on Thursday, with the BSE Sensex slumping 953 points to an intra-day low of 35,022.12 points and the Nifty slipping below the 10,600-level. The Indian stock market indices closed at four-month lows as macro concerns like a weak rupee, widening current account deficit, negative global cues, rising crude oil prices and capital outflows continued to weigh heavy on investors’ risk-taking appetite. On Thursday, the BSE Sensex plunged 806.47 points or 2.24% to close at 35,169.16 points. The NSE Nifty closed 259 points or 2.39% lower at 10,599.25 points. 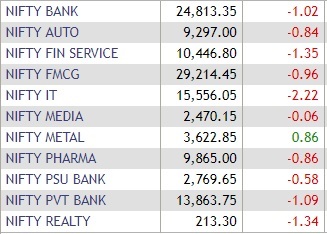 The Bank Nifty tanked 1% to close at 24,819.30 points. The Indian rupee slumped to a fresh record low of 73.8175 per US dollar intra-day. Mukesh Ambani-led Reliance Industries slumped over 7% and was among the top drags on both the Sensex and Nifty indices. All the sectoral indices on the NSE slipped into the negative territory led by pharma, IT, FMCG, financial services, banks, and auto. 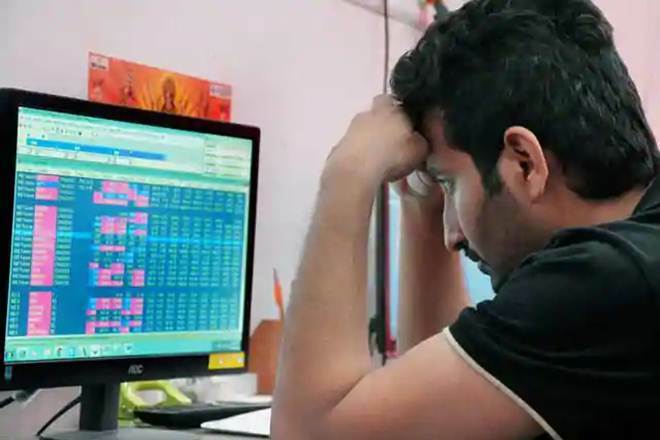 Reliance alone wiped off 275 points from the Sensex index, followed by HDFC Bank (-143.93 points), TCS (-105.94), Infosys (-82.23), ITC ( -63.05) and HDFC (-40.44). Oil marketing companies stocks cracked up to 21% after the government on Thursday announced Rs 2.50/litre relief on petrol and diesel prices. The government has cut excise duty on petrol and diesel by Rs 1.50 per litre. OMCs will cut fuel prices by Rs 1 per litre, the government announced on Thursday. ICICI Bank shares surged 4% after Chanda Kocchar on Tuesday announced her resignation as the bank’s MD and CEO with immediate effect. "Range for nifty is 10,500 to 11,000. We may see some more moves by RBI on Friday and Government too which may give some relief temporarily. Bank nifty may hold for a while till RBI policy but stocks are under pressure and interest rate hike will cause pressure on earning for NBFC and HFC as well as companies having a debt driven Capex plans. Some relief rally may come by measures like Saudi Arab agreeing to increase production, fuel price cools off, Government steps and short covering too in next week from 10500 level to 10700-10750 level. Volatility may remain for a couple of weeks more." "The Sensex & Nifty has fallen sharply on the back of selling witnessed across all Asian markets. Since most Asian markets are importers of crude the impact of rising crude prices and rising Dollar Index will weigh on their Trade Balance. Amongst Asian markets India is the highest importer of crude after China hence the impact on India’s Trade Deficit is very high. FPIs are selling in emerging markets which is visible in India also. Nifty has broken the 200 DMA placed at 10,777, which has intensified the selling from market participants. Also, heavy weights like Reliance and few more stocks that had led the last 1200 points rally in Nifty from 10,500 to 11,700 are the ones that are correction sharply hence the impact is higher in today’s fall. If Nifty sustain below the 200 DMA for more than a week then the floor can shift to 10,000 on the downside." The Sensex provisionally closed Thursday's trade at 35,169.16 points, down 806.47 points or 2.24%. The Nifty closed below the 10,600 level at 10,599.25 points, down 259 points or 2.39%. OMCs bled after government announced relief measures for petrol, diesel prices. The Sensex fell over 900 points after The government on Tuesday announced Rs 2.50/litre relief on petrol and diesel prices. The NSE Nifty fell over 300 points. The government on Thursday said it will ask states to cut VAT by Rs 2.5/litre on petrol, diesel prices. The government on Thursday announced Rs 2.50/litre relief on petrol and diesel prices. The government has cut excise duty on petrol and diesel by Rs 1.50 per litre. OMCs to cut fuel prices by Rs 1 per litre, the government announced on Thursday. Chanda Kocchar has quit as the MD and CEO of ICICI Bank on Thursday with immediate effect. The board on Thursday accepted Kocchar's request to seek early retirement. The board has appointed Sandeep Bakshi as MD, CEO for 5 years w.e.f. October 3. Shares of ICICI Bank were trading 2.80% higher at Rs 312.10 on the BSE. "Equity markets in India fell more than 2% on Thursday and breached its 200DEMA (10777) in the process as of 12.30 pm. Markets fell with above average volumes, suggesting selling by institutional players mainly in hitherto stronger shares including IT services, Reliance Inds, some private Banks and insurance companies. Traders seemed to have taken cues from the technical breach and build short positions in select counters." "Key issues concerning the markets include the direction of the Rupee which is the past month’s worst performing emerging market currency having fallen to a new record low of 73.90 earlier in the session. On Thursday however the Rupee showed some signs of stability in the first half the session. Market participants are pinning their hope on the Reserve Bank of India and government taking necessary measures to arrest the decline in the value of the Rupee." "Most Asian markets are down sharply in response to the spike in U.S. Treasury yields to levels unseen since 2011, which makes it challenging for other asset classes to attract buying. 10 Year yields in the US touched 3.17 on Wednesday and has inched up further on Thursday. Crude prices which have touched a 4 year high is another reason for concern for our markets as it affects the macros and then indirectly the growth rate of the economy. Trade war situation seems to be escalating lately which could impact global trade and its consequent effect on the Indian economy." "The Govt has been proactive and trying to tackle the situation keeping fiscal discipline in mind. Timely apt decisions (a series of them) from the Govt/RBI could help in turning around the sentiments in the bond and equity markets even as one hopes that the global situation does not worsen much in the near term. While the Indian markets are now much cheaper than a month back, analysts will have to rework their earnings estimates based on the recent developments locally and across the globe." The Indian rupee continued to trade on a weak note amid rising crude oil prices and negative domestic equity markets on Thursday and traded at 73.6362 against the US dollar. The rupee traded a little recovered from its fresh record low of 73.8175/$. The dollar held at a six-week high on Thursday as an overnight jump in U.S. Treasury yields on the back of strong data prompted investors to add long bets in the greenback against higher-yielding and emerging market currencies, reported Reuters. Yields on benchmark ten-year U.S. Treasury yields jumped nearly 12 basis points on Wednesday, climbing to 3.23 percent, its highest levels since mid-2011 after private payrolls data was stronger than forecasts. European shares fell in early trade on Thursday, led lower by defensive stocks, while banks tracked gains by their U.S. peers after strong data lifted Treasury yields to their highest since mid-2011, said a Reuters report. The pan-European STOXX 600 benchmark index was down 0.5 percent by 0726 GMT. Germany's DAX also declined 0.5 percent and the UK's FTSE fell 0.6 percent. Defensive companies including consumer and healthcare stocks were the main drag on the STOXX. Shares in British American Tobacco, Nestle and Novartis were down between 0.6 and 3.7 percent. Their losses were partly offset by gains among banks , which tend to benefit from rising rates and bond yields. German lenders Commerzbank and Deutsche Bank were up 1.9 and 1.5 percent respectively, as German 10-year bond yields hit a 4-1/2 month high. The BSE Sensex recovered from its over 850 points fall and traded 696.34 points or 1.94% lower at 35,279.29 points. The slight recovery was led by gains in Yes Bank, L&T, Vedanta, Axis Bank and Tata Steel shares. Shares of Reliance Industries marked the steepest fall this year, falling 7% to an intra-day low of Rs 1,120 per share on the BSE. Meanwhile, the Sensex slumped 858 points to an intra-day low of 35,116.82 points in afternoon trade deals on Thursday. RIL was the top Sensex loser. The BSE Sensex extended losses during late-morning trade deals on Thursday and plunged 812 points to an intra-day low of 35,163.28 points. The Nifty tested the 10,600-level and hit a low of 10,605.45 points on huge sell-off across all sectors. Mukesh Ambani-led Reliance Industries slumped 6% and was the top drag on both the Sensex and Nifty indices. BSE Live: Sensex down 700 points! The Sensex tanked 717 points to an intra-day low of 35,257.93 points during late-morning trade deals. Around 11.35 am, the Sensex was trading 716.24 points or 1.99% lower at 35,259.39 points. Reliance Industries remained the top drag on the BSE Sensex, down 5.09%. Apollo Tyre, Bharti Airtel, IndiGo, Bombay Dyeing were among the buzzing stocks in trade today. The Supreme Court Thursday granted one more opportunity to mining major ArcelorMittal and Russia's VTB Capital-backed NuMetal to bid for Essar Steel if they clear their NPA dues in two weeks, said a PTI report. A bench comprising Justices R F Nariman and Indu Malhotra held that both the firms were ineligible under amended Insolvency and Bankruptcy Code to bid for the firm but granted them a fresh opportunity after taking note of the plea of Committee of Creditors that it does not want liquidation of Essar Steel. The apex court exercised its extraordinary power under Article 142 of the Constitution in allowing ArcelorMittal and NuMetal to make fresh bid for Essar Steel. The top court asked the Committee of Creditors to take a decision within eight weeks on rival bids of NuMetal and ArcelorMittal for Essar Steel. "Yesterday US ADP number surprised to the upside and ISM Non manufacturing (best since 2005) also came positive propelling DXY higher till 95.70. We anticipate 96.30 levels which means more pain for rupee. In spite of high US crude inventory and private deal between Saudi Arabia and Russia, crude continues to climb and is now above $86 which means added pressure on our currency. Volatile equity market and steep FII outflows from debt market is keeping sentiment negative for our currency. 75/dollar looks on the card soon and trigger for currency would be tone of RBI policy tomorrow." -- Bhavik Patel, Senior Technical Analyst, Tradebulls Securities told FE Online. 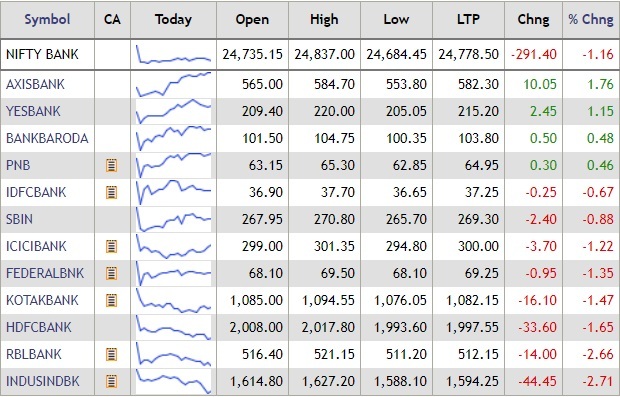 24 out of the 30 Sensex stocks traded in the red during pre-noon trade deals on Thursday. 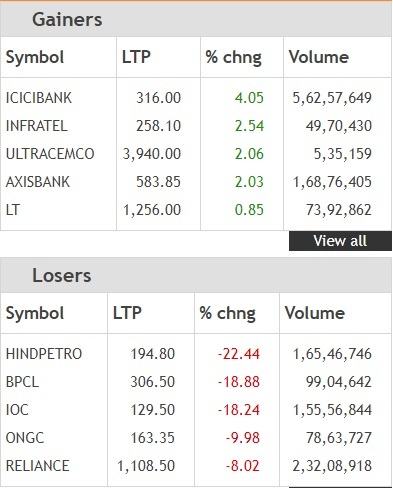 The Nifty Bank index was trading with losses during mid-morning trade deals on Thursday, with shares of IndusInd Bank down nearly 3%. 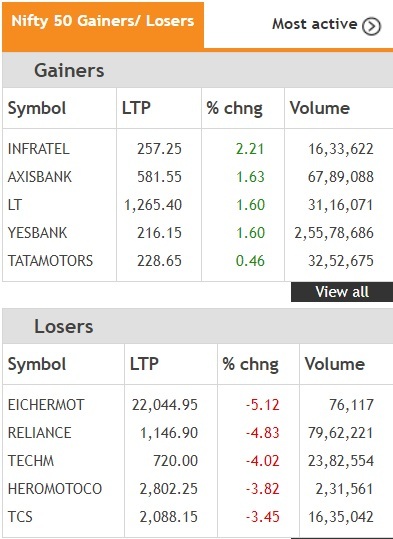 Shares of Yes Bank, Axis Bank, Bank of Baroda and PNB bucked the trend and traded with gains. Shares of Indian broadband services provider Hathway Cable and Datacom Ltd climb as much as 6.3% to Rs 29.50 on Thursday. 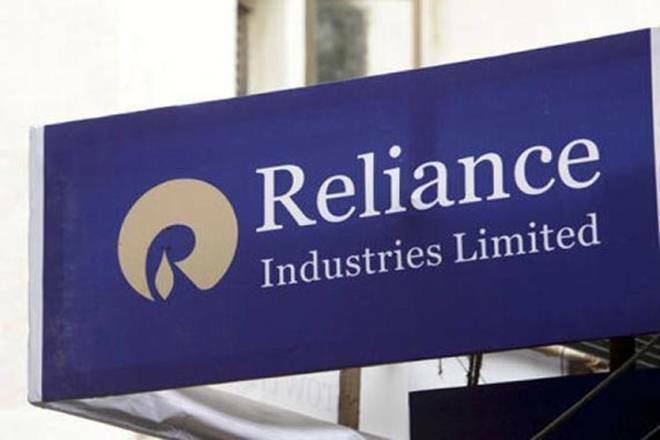 The company's share price rose to their highest since June 22 after it clarified on Wednesday saying it would not comment on market speculation of acquisition by RIL, in line with Reliance Industries' statement. Hathway's stock had fallen nearly 31% this year up to the last close. Media reports circulated on Wednesday saying Reliance Industries Ltd was in talks to buy Hathway Cables. The Indian rupee continued its downward spiral and slipped further to hit a fresh record intra-day low of 73.8175 against the US dollar. Higher crude oil prices and persistent capital outflows weighed heavy on the rupee's sentiment. Oil traders have piled into wagers that U.S. crude oil could surge to $100 a barrel by next year, a milestone that until recently many considered unthinkable due to record U.S. production growth and relatively flat global demand, said a Reuters report. But the imminent return of U.S. sanctions on Iran and bottlenecks keeping U.S. oil from getting to market have fueled a rally that has taken benchmark oil prices to four-year highs. While big producing nations say supply is ample, hedge funds and speculators are increasingly skeptical of that argument, betting the market could rally further as sanctions on Iran's crude exports return on Nov. 4. The BSE Sensex extended losses during Thursday's mid-morning deals, plunging over 650 points to an intra-day low of 35315.91 points. Reliance Industries was the top drag on the Sensex, down 5.4%, followed by Hero MotoCorp, TCS, HUL, HDFC and Bharti Airtel. The Nifty IT index traded with losses during mid-morning trade deals on Thursday despite a weak rupee. Tech Mahindra was the top drag on the index, down over 4%. TCS and Infosys shares were trading lower by up to 3%. On Thursday, oil marketing companies (OMCs) raised petrol and diesel prices by 23 paise adding more pain to the common man. The petrol and diesel prices in Delhi today are Rs 84 per litre (increase by Rs 0.15) and Rs 75.45 per litre (increase by Rs 0.20), respectively. The Indian rupee extended losses and slipped further to hit a fresh record intra-day low of 73.7962against the US dollar during mid-morning deals on Thursday. The rupee collapsed to a fresh low against the US dollar on Thursday, as global oil prices continued to rise, deepening concerns about the current account deficit and capital outflows. All the sectoral indices faced heavy selling pressure and traded in the red, expect the metals index, which traded 0.86% higher. Reliance Industries' Chairman Mukesh Ambani has emerged as the richest Indian for the 11th consecutive year with a net worth of USD 47.3 billion, according to Forbes magazine. Ambani is also the year's biggest gainer, adding $9.3 billion to his wealth amid the continuing success of his Reliance Jio broadband telco service. As per the 'Forbes India Rich List 2018', Wipro Chairman Azim Premji has retained the second spot, adding $2 billion to his wealth at $21 billion; while ArcelorMittal Chairman and CEO Lakshmi Mittal moved a place ahead to the third slot with a net worth of $18.3 billion, increasing his wealth by $1.8 billion. India's infrastructure major Larsen & Toubro has announced a share buyback programme for Rs 9,000 crore. The company has cash and liquid assets of about Rs 17,425 crore and a consolidated debt of Rs 1.08 lakh crore. The buyback offer will be made via the tender offer route and about 6 crore shares aggregating to 4.29% of the total paid equity share capital – will be bought back. The rupee plunged to a fresh low on Thursday hitting 73.76 per dollar in the early trade as sharp rise in oil prices heaped more pressure on the currency. 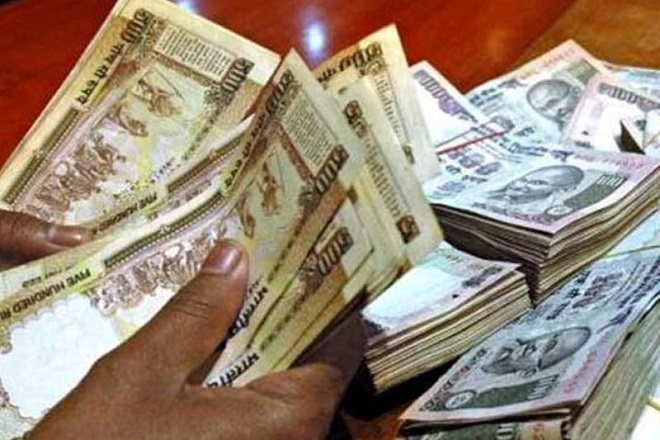 The partially convertible rupee closed at 73.33 on Wednesday. Amid fall in domestic currency, benchmark 10-year bond yields hit 8.20 percent in opening trade as against previous close of 8.11 percent. The BSE Sensex plunged over 600 points to an intra-day low of 35,341.68 points in early trade on Thursday. The Nifty plunged to a three-month low. The dollar notched an 11-month top on the yen on Thursday as stunningly strong U.S. economic data drove Treasury yields to their highest since mid-2011, while Asian stocks were pressured as borrowing costs rose at home, said a Reuters report. Higher U.S. yields are anything but favourable for emerging markets as they tend to draw away much-needed foreign funds while pressuring local currencies. Bond prices fell across Asia and long-term Japanese yields reached ground not visited since early 2016, a market tightening not warranted by domestic economic conditions. Sensex live: The BSE Sensex plunged 155.10 points or 0.43% to 35,820.53 points in the pre-open trade session on Thursday. The NSE Nifty slipped below the 10,800-level, down 103.55 points to 10,754.70 points. The rupee slumped to a fresh record low of 73.7688 against the US dollar. RUPEE opens at fresh record low! The Indian rupee opened at a fresh record low of 73.6712 against the US dollar on Thursday. The rupee had closed at a new record low of 73.3412 per dollar on Wednesday, Bloomberg data showed. The rupee had breached the 73/$ mark for the first time yesterday. Share market HIGHLIGHTS: The Indian stock markets closed Wednesday's trade in the negative territory with the BSE Sensex slumping over 590 points intra-day and closing below the 36,000 level, down 550.51 points or 1.51% at 35,975.63 points. The Nifty tanked 150.05 points or 1.36% to end at 10,858.25 points.